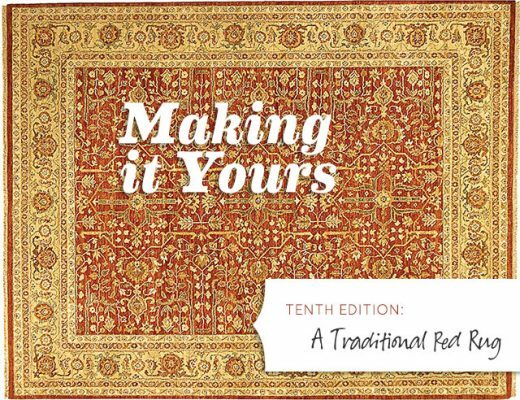 I’m working on my fourth edition of Making it Yours! 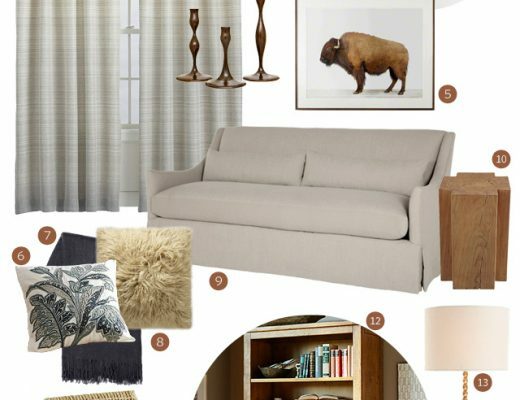 This one will be a little different; instead of following one piece of furniture through five different rooms, we’ll be following four pieces of bedroom furniture through five different looks. It’s been a fun exercise for me, but I also think it’s true to real life and therefore more true to what MiY is all about. 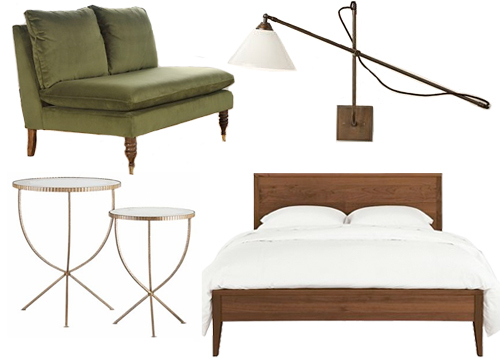 In this edition, we’ll have a wooden bed, a set of two tables, a sconce for each side of the bed, and a small sofa. I chose that sofa in green velvet to give myself a bit of a challenge, and to show that you don’t have to cling to beige for versatility. If you love a color or a print, you can find a way to make it work in a variety of ways! Yay! A new MiY! I not only love the way you design the imagined rooms but I love the way you design your moodboards. Can’t wait to see this series. i just love these! I tried to do one for my room the other day. It didnt work out like yours. So i think i’ll just leave it up to you for the beautiful ideas from now on. Keep up the awesomness!! That couch should be mind. Oh, if only I had the space. It’s beautiful, and I love that you went with the green velvet. Such a rich, neutral color. I can hardly wait to see what you’re going to come up with. The pieces you’ve chosen already have me excited! They are beautiful! I have been dying to get wall mounted swing arm sconces for our room, so this excites me! Although, I think that price is a little out of my range. I can only wish we had room for a couch in our bedroom though. Barely enough room for the bed. Yay! We almost bought those C&B side tables, but were afraid they looked too traditional for our room. I’m looking forward to seeing how you use them! Oh Yay! I am so excited for this new version. I can’t wait to see what you come up with. Oh, btw, your new business cards are adorbs! My husband and I are saving up for those side tables right now – love them! Can’t wait to see what you put together for the room. Ahhhh just the MOTIVATION/INSPIRATION I need to get going on my own MIY redo of the ol’ bedroom… Love your work! I can’t wait to see what you come up with! 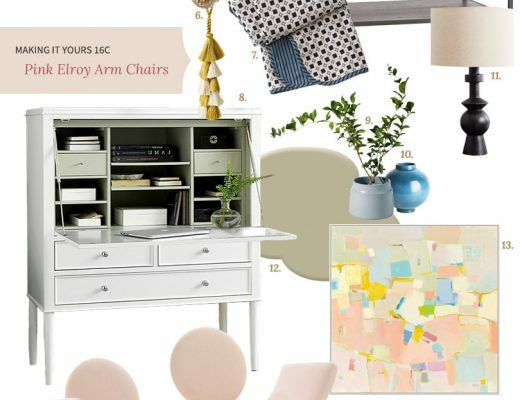 And lucky me – I am in the process of revamping my bedroom, so this is just perfect timing as I am so drawn to your sense of style and I will be sure to gain a few excellent ideas! And psst – I am one of your classmates in BYW :) Hope you are having a lovely day! Such pretty pieces. This should be fun! can’t wait to see this! love these pieces and you ALWAYS do an incredible job!! I adore the green couch! V. cool idea – people always want to change up their look, but can’t change big ticket items that readily. Look forward to seeing the options! I am way too excited about this. Your posts are such an inspiration! They always make me want to change things up in my apartment. I can’t wait to see it! And I love the green couch…Nate Berkus? Oops…just realized the boards are up! Yes, Nate Berkus!